I can't believe its been two weeks since the madness of frantically making ice cream for a bunch of three year olds. Funny thing is I am not sure if the adults were more excited than the kids. Man, you should have seen the size of some of the sundaes created. In the end I made eight flavors, had 10 toppings, and way too many leftovers. I think this may become an annual tradition but only if people promise to bring some home. The Cake Batter ice cream has been calling my name every night since last Saturday which is not a good thing around here. In retrospect I wished I had little score cards so everyone could rate each flavor but I didn't so here is what I think are the results. Seeing as the container with the least amount of ice cream left was Oreo Cookie I think that takes first place. I did get a comment that it had more cookies than ice cream so I'll lay off the Oreos next time, but it still seemed to go. And it was actually the one flavor I was able to send out the door with them. The next popular was the Peanut Butter Cup, although hard as a rock, and third place prize would probably go to the Cake Batter, which is my personal favorite out of the bunch. Also, because a three year old can't comprehend that we are not having a cake on her birthday, just ice cream, I had to honor her wishes and get her a princess cake to blowout her big three candles. I made the mistake of showing her a cake book with this crazy Barbie cake and she instantly became obsessed and had to have it. So here I am 8am the morning of her birthday jamming her Barbie in the cake and piping ribbon. Oh what moms will do for their kids. But I had to share because I think the thing is hysterical. If you could have seen me and my husband fighting about how Barbie should be properly jammed in the cake you would have laughed. So we not only enjoyed plenty of ice cream but had the joy of Barbie to go with it. So this posting isn't all together so informative but what I learned from having an ice cream party is...start churning a few weeks prior or have two freezer canisters to speed up the process. Second, take all ice cream out of the fridge at least 10 minutes before as some of mine was a hard as a rock and difficult to serve. Third, watch the amount of mixins put into the base of your ice cream. I found my peanut butter cup and oreo had more candy and cookies than ice cream. And lastly, send leftovers home with guests! 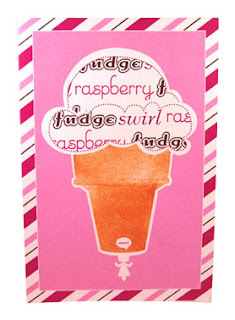 An Interview with Motormouthpress, LLC -- Ice Cream Greeting Card Designer Extraodinaire! In my search for note cards with ice cream for the Sweet Notes and A Contest With Sweet Rewards entry, I hit jackpot. I had really been craving some letterpress ice cream notes and came across Motormouthpress, LLC. Such a variety of ice cream (and other food related cards)...I was in heaven! Curiosity got the better of me, and I decided to separate this from the original post, and emailed Laurie of Motormouthpress to see if she would do an interview with me. Lucky for us all, she agreed! Without further ado, I bring you Laurie! And when I am done with this post, I am off to shop at Motormouthpress! Can't wait! Scoopalicious: Is there anything you want to tell your lovely fans to start off? Motormouthpress: Well, if you didn't guess it already, Motormouthpress, LLC specializes in food-themed stationery and cards that double as mementos. We call these cards our Specialty Line. Our Postercard is an example of one of these cards (see below). For those of you who already figured this out already, here's a tidbit that we haven't mentioned yet. Our website is currently undergoing a redesign. Expect a sweet new appearance with easier navigation and new cards to boot! If you want to join out email list, please submit your email on our contacts page at www.motormouthpress.com. Scoopalicious: Are you the founder/sole creator of these cards? How do you choose the subject matter? Motormouthpress: I am the founder and sole creator of these cards, except for the Let's get Gnawty card. This one was designed by my friend, Brittany Powell. 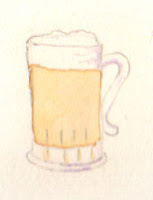 All of my illustrations are original designs. I am influenced by sweet treats of all kinds. I love how they are displayed and how they make your taste buds dance when you eat them. Scoopalicious: Are all your cards letterpress? If not, how do you decide which are going to be letterpress and which will be offset? Motormouthpress: I carry both letterpress and offset lithography printed cards. As far as deciding which gets what, I usually let the design tell me as I create it. This may sound ethereal but, it is part of my creative process. Scoopalicious: What is your favorite dessert? Motormouthpress: I don't have one in particular, but my Grandma's blueberry cobbler with a scoop of Breyers Vanilla Bean at the top. Scoopalicious: Do you print the cards yourself? Motormouthpress: I am trained in all the print processes that I use, which makes working with local printers a easy and exciting. Scoopalicious: How did you get started in the card business? Motormouthpress: Serendipitously. A colleague invited me to design some greeting cards. I really enjoyed it, and wondered if it was possible to do it professionally. Scoopalicious: Did you go to school for art/design? Motormouthpress: Yes, I earned a BFA in Graphic Design and a MFA in Book Arts/Printmaking. Scoopalicious: One of the coolest things you make are your poster cards. This is a totally creative and unique idea that has so many layers and aspects to it, and practically guarantees that the recipient will not throw away your cards (though in my book any of your cards would find a place on my wall!). Anyhow, can you tell us a little about these cards and how you came up with the idea for these? Any plans to make ice cream poster cards? 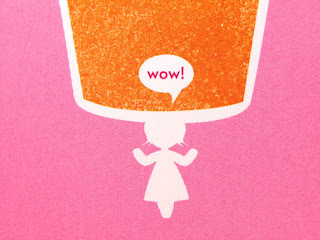 Motormouthpress: The Postercards are what actually inspired me to become a Stationery and Greeting Card Designer. It encompassed everything that I hold dearly about graphic design folded into one greeting card. It is a memorable and engaging design that not only sends you a greeting but leaves you with a memento. You have a cute image on the front that leads into a greeting or place for you to write. Unfold the a second time, and it shows a recipe to share. Unfold it all the way, and it reveals a poster of the visual instructions of the recipe and you and your friend making the recipe together. It is a double layer story. One is the greeting and sharing of the card itself, and the second is the card acting as a memento and the memories it may evoke. The idea of the Postercard came from the desire to create a card that someone would cherish and save rather than recycle. Sometimes, it is hard to find a card that says exactly you want, and sometimes you don't know really what to say. This card resolves both these issues. Scoopalicious: Any plans to make ice cream poster cards? 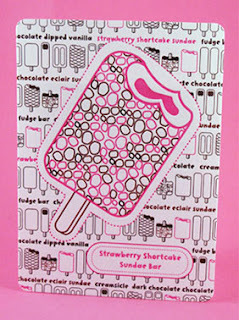 Motormouthpress: I would love to do an ice cream Postercard; but any new Postercards most likely won't appear until 2009. Scoopalicious: Do you have a best seller? Motormouthpress: No, I actually have several. The most popular are the Letterpress Birdies and Ice Cream Sandwiches and Bars followed by the Sweet Treats Line of Cupcakes, and Ice cream Sandwiches. Scoopalicious: What is your favorite ice cream flavor? Motormouthpress: I don't really have a favorite; it is too hard to choose, but right now I like coconut or coconut praline. Scoopalicious: What is your favorite ice cream treat? Motormouthpress: I don't really have just one. I have favorites. I like hot fudge brownie sundaes, push-ups, dreamsicles, ice cream sandwiches, ice cream cone sundaes, malts, and ice cream cookie sandwiches the most. Scoopalicious: Your company is located in San Francisco, yes?...do you have a favorite ice cream spot to go when you want that perfect scoop? Motormouthpress: I usually go to Maggie Mudd's because they offer Vegan Ice Cream. I am lactose intolerant. But if I pop a few lactose pills, Bi-Rite Creamery makes a killer peach pie sundae in the Summer. Special thanks to Laurie for answering all of our questions! All images © Motormouthpress, LLC. 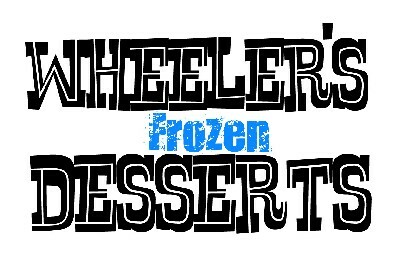 Quick Sunday night note: Just wanted to let you know if you are in the Boston area, there is a tasting tomorrow night of Boston-based Wheeler's Black Label Vegan Ice Cream! Check it out! Not sure if I can make it, so please report back if you attend! On another note, please feel free to let us know if you know of an upcoming ice cream event in your area! 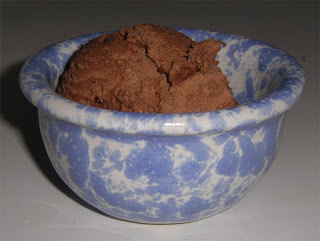 A while back*, my friend Claudia and I made some Mexican Chocolate Ice Cream out of Bruce Weinstein's The Ultimate Ice Cream Book. Instead of regular cinnamon, we used Saigon Cinnamon in its place. I thought the ice cream would have a bit of a "spicy hot" taste, but really, the ice cream just tastes like rich chocolate, not even cinnamony chocolate. It was very smooth and decadent either way. However, I wonder if I should use more cinnamon the next time I make it. That might be a good idea since I talked my husband into getting a big Costco sized bottle when we were there a while back -- gotta use it sometime! What was fun about this project was that since there wouldn't be enough time to make the base and then chill it with Claudia, I made the base in advance so we could chill it together, and when she came, we made another base which she took home with her. It was just like a lesson on a real cooking show! Claudia and I also prepared (for her to freeze at home) my very own Lisa's White Chocolate Cranberry Cookie Ice Cream, which I will blog about and include a recipe in a future post! *A while back was January 23. As this was almost a month ago, I'd like to note that this ice cream seems to be keeping very well -- it tastes and looks like it was made yesterday! Its been awhile and thankfully Bethany has graciously picked up my slack but I am back in ice cream business. It's birthday party week at the Snyder household so a what great excuse to make it an ice cream party. I have been busily cramming to get in as many flavors as possible for Saturday's festivities(and figuring out how to get a princess theme mixed in!). Since the main guests are a bunch of three years old it is only appropriate to serve Peanut Butter & Fluff. In my favorite(& only) ice cream cookbook I found a fantastic recipe for the peanut butter base. After some research I chose creamy Jif as my peanut butter additive, as others said this gave the best results. It is extremely rich, creamy, and literally tastes like a jar of peanut butter. I do expect it to be too much for some but I give it the thumbs up. I'll let you know what everyone thinks after the party. Hey, the worst thing that could happen is that noone eats it and I have lots of leftovers...yum! My first challenge in finalizing my ice cream...how does one get a jar of thick and gooey marshmallow to swirl? I was in Whole Foods and highly doubted they carried "Fluff" and luckily found the cutest tub of marshmallow. The brand is Tiny Trapeze Confections, creator of fantastic natural candy and marshmallows, and just the design of the tub alone made me want to buy it (side note I just found out they are in Hyde Park MA...right in our back yard). Once I could get myself to break it open I took Bethany's advice and added a couple tablespoons of milk to thin and voila...marshmallow swirl. Now my second challenge, how do I get the marshmallow to be perfectly swirled in my ice cream? Well I really wasn't all that successful on this so I think practice will make perfect on this one. I have a KitchenAid ice cream attachment and its contruction does not allow ease of swirling, my biggest complaint. So I tried swirling by hand and gots lots of puddles and strings but although it might not be perfectly swirled I have a feeling it is going to be a hit. So one day and counting for the verdict and I'll be sure to fill you in on the feedback. Other flavors on the menu...Oreo Cookie, Peanut Butter Cup(I doubled the base and it made tons), Peanut Butter & Fluff, Triple Chocolate, Confetti Cake Batter, Coffee, Mint Chocolate Chip, and I am hoping I can fit in one more kid-friendly flavor and of course all the fixins will be had too. Oh and I found these cute little dishes to give as favors. Happy 3rd Birthday Holly! Udder Delight Ice Cream House has flavors such as Memphis Barbecue and Bacon. Many, many thanks to sister Arianna for her extensive help in compiling this list! Sassy Sauces and an Interview with the Sassy Sweetmaker Herself! Last weekend my sister and I stopped into Shake the Tree in the North End for an ice cream party featuring the fabulous Maureen Harder's Sassy Sauces. Maureen herself was a simply charming woman, and Arianna and I left the party unsure as to whether we enjoyed the company or the sauces more! Maureen had warmed up both the bittersweet chocolate and the rum caramel sauce and was serving it over vanilla ice cream. Not a huge fan of liquor based anything, I chose the bittersweet chocolate. Wow. What a treat! A true reporter, I owed it to my audience to try the rum caramel as well, to which I turned to Maureen and said something like "I don't even like rum, but this is good!" Maureen also had tasting spoons for sampling the spicy dark chocolate and the peanut butter fudge sauces. Though they weren't heated, they still were amazing, and I knew that if I bought a jar I too would be eating right out of the jar. In the end, Arianna and I bought our sister a jar to send in a care package, so even though she couldn't be at the tasting with us, she could at least experience a bit of this chocolatey goodness! After the event, Maureen graciously answered some questions about Sassy Sauces, so here is the inside "scoop" -- yes, pun was definitely intended! Scoopalicious: I read on your website that you made the original Sassy Sauces as a gift one Christmas, and because of the success of the gift, you decided to make these sauces for sale. How soon after this fateful Christmas did you start making the sauces? Maureen: I started making my sauces about a year after that in November of 2007. It was really an eye opening experience starting a business in Massachusetts, deciding on if I should incorporate or do an LLC, getting all the licensing for state of Massachusetts wholesale. You also have to go through something called a scheduled process when you begin producing a food product which requires someone reviewing your recipe and procedure to see if it is safe and proper. Lastly, I had to find a commercial kitchen that I could use that had all of the equipment I needed. I began making my sauces in Vermont and later moved to Western Massachusetts because it was a bit closer. Scoopalicious: How long have you been selling Sassy Sauces? Maureen: I have been selling them a little over a year. Scoopalicious: Do you make the sauces alone or do you have help? Maureen: I employ my husband who receives no salary but gets all the sauce he wants and gets to hang with his wife away for a weekend. Scoopalicious: How large a batch do you mix up at a time? Maureen: We usually do 200 pound batches of each flavor. Scoopalicious: Tell us little about the kitchen that allows you to make such large batches! Maureen: I make my sauces at a commercial kitchen called the FCCDC it is the Franklin County Community Devolepment Center in Greenfield, MA. It is a commercial kitchen for small food business and entrepreneurs. Scoopalicious: Do you do this full time? Maureen: I do. I also have a 3 1/2 year old boy and a 20 month old boy who I stay home with so it is interesting. I depend on my husband a lot when I do events and I bring my youngest on sales calls. Scoopalicious: Which is your favorite sauce? Maureen: I am loving to Spicy Dark right now but they all appeal to me at different times. Around Thanksgiving I am all Rum Caramel because it is awesome with pie and bread pudding and of course I have a peanut butter addiction. Scoopalicious: Any other new sauces in the works that we should get excited for? Maureen: I am working on a butter toffee that is so yummy and creamy. Maureen: I worked with this pastry chef that used to make saffron and pink peppercorn when I first started in pastry. Personally I am in love with black forest, sour morello cherries, kirsch liquor and bittersweet chocolate chunks in a vanilla base. But I also like chocolate s'mores, and passion fruit prosesco sorbet. It really depends on the season and my mood....I mean in strawberry season...forget it plain strawberry is great or strawberry cheesecake. Scoopalicious: Your package design is just fabulous! What caused you to give the sauces a funky, retro look? Maureen: A friend of the my family designed it for me and it is perfect because what everyone says is that the sauces remind them of the hot fudge sundae they would get when they were little. It is definately a throw back to a time when everyone was so put together and fabulous. I want people to look at my sauces as a chance to be fabulous whether it is throwing together a fondue party or whipping up chocolate mousse with the bittersweet chocolate or making an amazing sundae. Scoopalicious: What do you have as future plans for your company? Maureen: I am really hoping for great things, I want to expand my sauce line and have some great ideas. I would love to get into other pastry items, I have been working on some mixes and things for the farmers markets this summer and really just love baking and creating good wholesome stuff for people who like sweet treats but don't have time themselves. Special thanks to Arianna for her help with the questions and for being a great sauce tasting date, and to Maureen Harder for answering all of our questions! All images © Maureen Harder, Sassy Sauces. 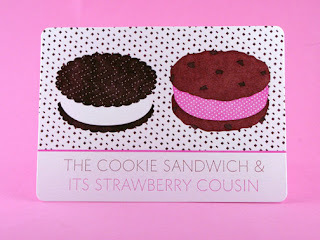 Arianna directs us to Just Jenn Designs, who sells a set of six flat cards that includes a lollipop and an ice cream cone (three of each of the design) for just $8.00! I think my favorite part is if you flip the card you get a nice little lined writing space with images of sweets screened back to write on! Simple and elegant, these cards are perfect for writing that short little note just to tell someone you are thinking about them. 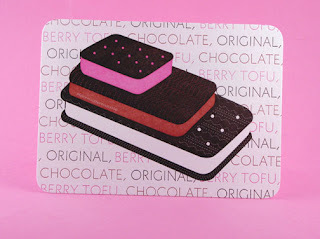 She also sends me over to Gingerbread City's Cafe Press shop for a surreal ice cream cards, straight out of Candyland. These are a little less simple than the cards I would usually choose, but they sure are fun! Lastly, she found some super fun ice cream items at Fred Flare, simply by doing a search on "ice cream". Perfect for the ice cream stationery posting, she found a great set of sweet cards, in which one of the card pairs was an ice cream cone (at right) paired with a gumball machine. These cards by Jack and Lulu are called "scratch and sniff" but it isn't clear from the site whether yhey actually smell or whether they are just called that because they are reminiscent of the scratch and sniff stickers of our childhood. Either way, I love the simplicity of the design, even though they price in steeply at $8 for two cards. Well enough from me today! When the weather gets a bit warmer, Tina and I have plans to head over to some local scoop shops for some sweet treats -- and I sure am glad this warm weather is only a few months away!